Here is a list of best free Memory Optimizer software for Windows, which can help you Auto Optimize PC memory as well as do so Manually, in a single click. Most of these software to optimize memory let you view real-time graph for available and used memory space of PC. Some of these memory optimizer software offer dual mode memory optimization feature, which can optimize your system’s memory even better, leading to a maximized PC performance. While most of these can be minimized to system tray, some of these freeware to optimize memory can be set to begin at system startup. In this list, you will find dedicated software to optimize PC memory, as well as PC utility software with various tools bundled together. Check out this list of Memory Optimizer freeware to know more about them, and also get the idea on How to Optimize Memory of your computer using these. Wise Memory Optimizer and Wincleaner Memory Optimizer are my favorite memory optimizers. 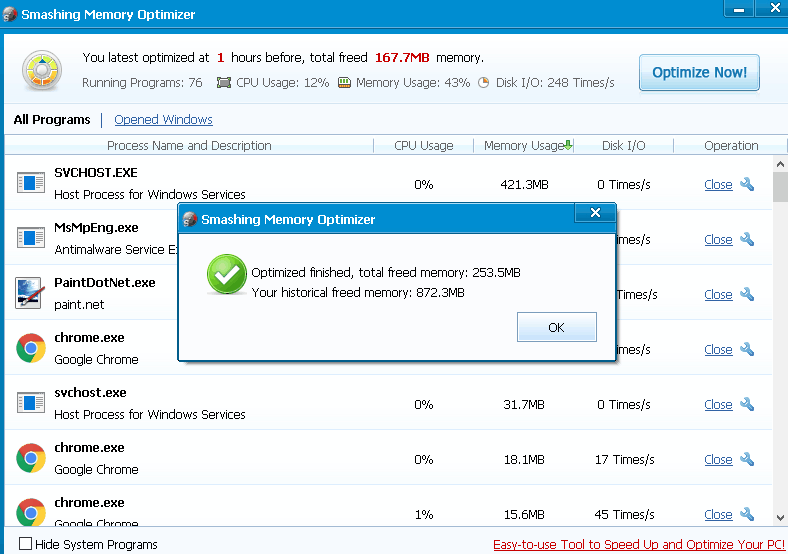 Wise Memory Optimizer offers a very simplistic approach for Memory Optimization in a single click, while Wincleaner Memory Optimizer offers a dual mode feature for the same task. These Memory Optimizer freeware display real-time graph plot for ongoing optimization process as well as statistics for CPU and Physical memory. You can also check out the list of Best Free RAMDisk Software, Best Free Software to Speed Up Computer, and Best Free Internet Booster Software. 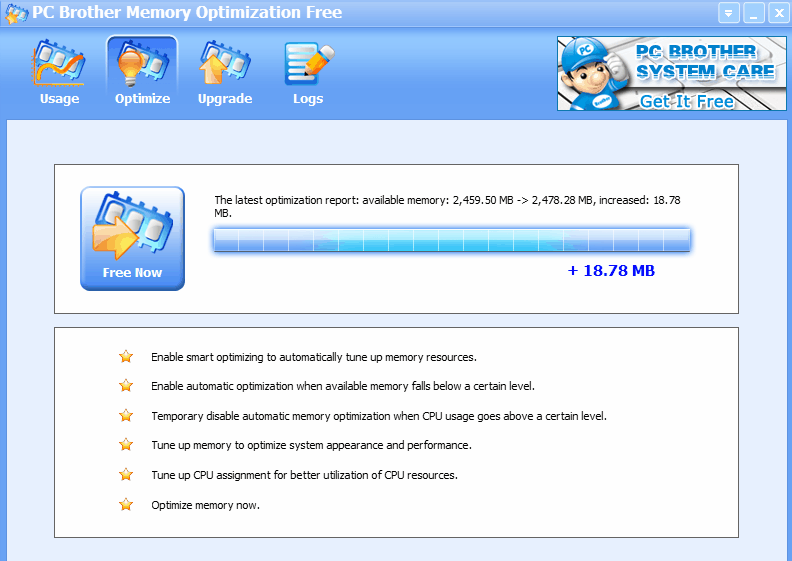 Wise Memory Optimizer is a free memory optimization software. This freeware supports both Manual as well as Auto-Optimization feature and you can use either or both to optimize system’s memory. Auto Optimization has to be enabled from the extended interface (click Settings icon) and henceforth, this freeware will start to auto optimize your PCs memory. You can use and adjust the slider bar to set the limit of auto-optimization process as well a Run it when CPU is idle. To Manually optimize your PC’s memory, you can just click on Optimize button on the interface. This will free up RAM (300-400 MB for my PC), which can be used for other process requirements. You can view Used Memory and Free Memory of PC and a Donut chart for the same is also displayed. You can also set it to Run When Windows Starts and it can be Minimized to System Tray when closed. I have added this free memory optimizer software at the top of this list as I was pretty much impressed by its easy optimization process without any hassle. During the optimization, I didn’t encounter any sort of program crash or any kind of error. HLP Free Memory Optimizer is another free memory optimization software that automatically optimizes the memory. It keeps monitoring the consumed memory, and auto optimizes it whenever the available memory is low. You can set the percentage of free RAM at which this software should automatically start optimizing the memory. In addition to auto memory optimization, it lets you optimize memory manually as well. Just click on “Optimize” button for the same. It comes with 3 different memory optimization levels: Best, Better, Good. These basically control how much memory should be freed up. This software also works in similar manner to the one mentioned above; it moves older running programs to system page file, so as to free up available RAM. 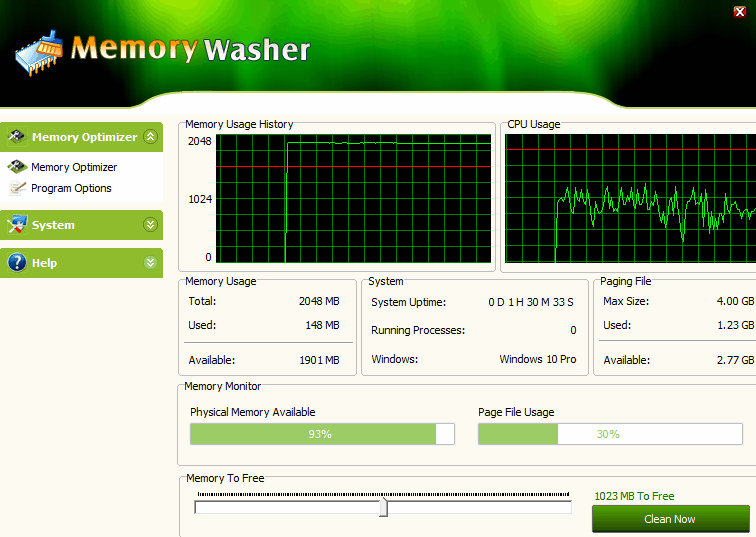 Memory Washer is another good Memory Optimizer software. With Auto Optimization feature, this free memory optimizer program can automatically optimize your PC’s memory. Although, Auto-optimization is not a default feature but once enabled (Memory Optimizer> Program options), it starts to monitor for any memory leak or memory space consumed by unnecessary files and eventually frees them to be used when needed. You can even set the time frame for automatic optimization and memory monitoring with this feature. You can even limit the memory space to be freed with the slider bar (up to 2047 MB). It displays a real-time plot graph for the ongoing memory optimization process along with Memory Usage, System, and Page File information. This freeware proves to be a good memory optimizer as it frees the memory without any glitch. The only issue I faced that while optimizing the memory, it used nearly all of my CPU. But still, it was for a minimal time and it optimized my PC memory well. RAMRush is one of the simplest Memory Optimization software I have tested so far. It can be set to optimize PC’s memory with Auto Optimization feature, or you can manually free up memory in a single click. For Auto-Optimization you just have to select its respective option but it will function only when the RAM percentage is below 8%. You can assign a hot-key for this feature too. Its interface displays a real-time graph plot for CPU and RAM usage. Apart from these, you can set this freeware to work at system startup and show notifications in the taskbar for an ongoing optimization process in the background. Mz RAM Booster is a free RAM optimizer software and you can use it to Auto Optimize system’s memory quite easily. You can simply enable its Auto Optimization feature from Options menu, along with set it to initiate according to your selected time frame as well as usage percentage level for both CPU and RAM. If you want, you can carry out memory optimization process manually as well. For this, it mainly features three tasks, which are Smart Optimize, Recover RAM, and CPU Boost. You can use Smart Optimize option for memory optimization process. You can view RAM information, General information, and Total CPU Usage information and get the idea when to set this free memory optimizer to perform its task automatically or manually. You can even select this program for tray minimization as well as load it at system startup. This free RAM booster utility is capable enough to perform all your PC tweaks and optimizations, ranging from RAM, CPU, and Memory. You can use it for memory optimization task for sure. Wincleaner Memory Optimizer is yet another Auto Optimization process supporting free memory optimizer software. 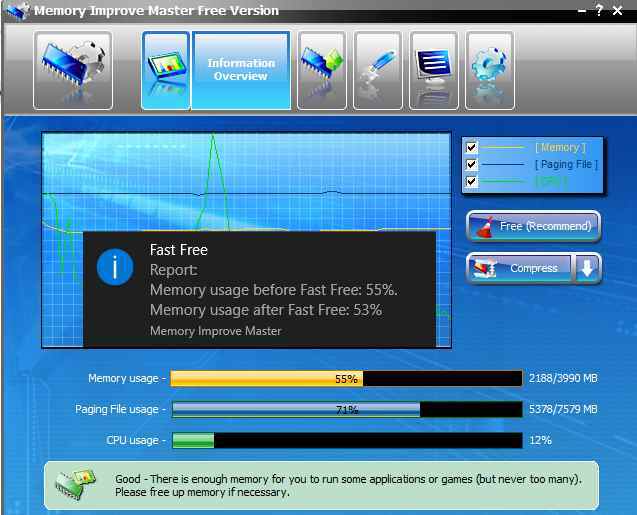 Your PC’s memory can be optimized automatically as well as manually with this freeware. The Auto Optimization feature of this free memory optimizer requires a RAM usage level, which you can adjust by its respective slider bar (up to 160 MB). Once the RAM usage of your PC reaches the limit, this freeware starts to auto-optimize your PC’s memory. You can also set the frequency of Auto Optimization process at a minimum time frame of 10 minutes. What I found unique with this free memory optimizer is that it features 2 modes for memory optimization: Optimize RAM and Maximize RAM. The former option optimizes the memory in a simple way like any other good memory optimizer program does. The latter options enables you to maximize the optimization process up to three passes. Besides all these, you can set it to load at system startup and optimize your PC’s memory. With all these features, this freeware can easily optimize and recover your PC’s lost memory up to a great extent. 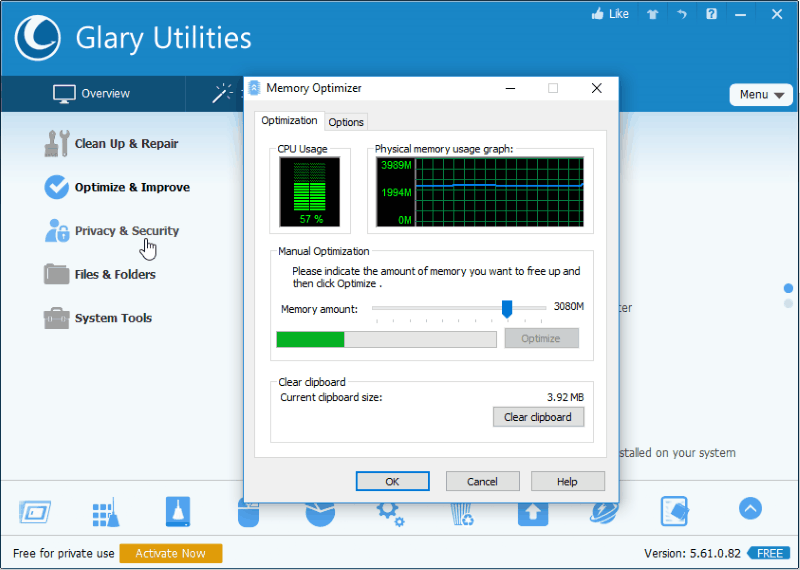 WinUtilities Memory Optimizer, as its name suggests, is a free Memory Optimizer software that can help you Auto Optimize your PC’s memory. It even has option to free up memory manually whenever you want. Auto Optimization feature of this freeware has to be enabled by selecting its respective option. You can set the limit of memory usage under this feature and it will automatically start optimizing the memory at this threshold. You can use its recommended Intellisense Optimization feature, which enables this free memory optimizer to optimize memory based on CPU usage pattern. With this unique feature, memory optimization will not start and you can use most of the CPU resource when needed. To manually start the memory optimization of your PC, you just have to click at Optimize button under Memory Information option. You can even slide and set the slider bar to free minimum or maximum memory. You can view real-time graphical chart for Memory Information and CPU information too with this free memory optimizer program. With Intellisense Optmizitaion and Auto-Optimization feature, not only this freeware proves to be a good memory Memory Optimizer software, but also gives you liberty to use the CPU up to its maximum when needed. Free MeM is a free memory optimizer software that lets you carry out memory optimization task automatically and manually. For Auto Optimization of PC memory, you have to enable its option. It then automatically monitors your system for available RAM. You can slide and set the Threshold value for optimization as well as speed for the process from Settings option. To optimize your PC’s memory manually, you just have to click on its Optimize now button and it will free your system’s memory in no time. This freeware can also be set to optimize memory at system startup. It displays a real-time graph plot for History of Memory-usage along with information on Current memory usage bar in percentage (Used and Free memory). As this free memory optimizer software automatically integrates to system tray when it starts, you can easily access it with the help of its default Hotkey combination. Memory Optimizer Pro is a free and simple Memory Optimizer program. Though Auto-Optimization feature is not supported with this freeware, you can still optimize your PC’s memory manually. You can begin the memory optimization process with a click on Recover Free Memory button. When the process is complete, a dialog box with the information for total memory optimized is displayed. Its simple yet attractive interface displays Used Memory, Cached Memory, and Free Memory, before and after the optimization process. With this feature, you can compare the memory status and get the idea of the available memory that you can use. If you need a simplistic and manual approach to optimize PC memory, this freeware might come in handy. Memory Improve Master Free version is another good memory optimizer program which can Auto Optimize your memory besides supporting manual optimization feature. Once the Auto-Optimization feature is enabled, you can set it to monitor and optimize your PC periodically ranging from 1 min to 60 minutes at max. You can even maintain a White List, Black List, Smart List and Idle List of programs according to your requirement for Auto Memory Optimization. Besides Auto Optimization, this free memory optimizer program also lets you Auto Compress PC memory when needed. You can periodically set this feature to function by setting its relevant criteria with the help of their respective slider bars. Apart from these Automation task, you can still manually optimize your PC’s memory. For manual operation, you can either use Fast Free option for a quick memory optimization or use Deep Compress option to compress the memory based on Size and Level slider bars. This freeware provides Memory usage, Paging File usage, and CPU usage related information with a real time graphical plot for the same. As this free memory optimizer is fully fledged with various memory optimization and compression features, it sure is an awesome freeware to be used for Memory Optimization tasks. 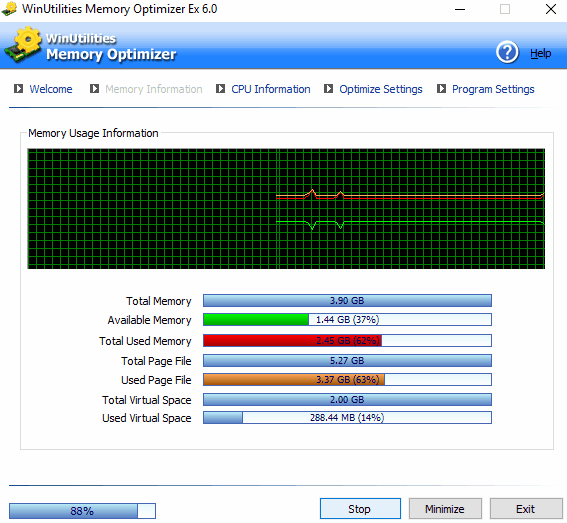 WX Memory Optimizer lets you Auto Optimize your PC’s memory and you can carry out manual optimization with it as well. The Auto Optimization feature needs to be enabled and after that it automatically optimizes memory every 20 minutes. You can even select it to begin its task when the Memory Percentage is over 40%. You can view Status of Physical Memory, details of Memory in Use, and Total optimized memory. The translucent interface of this free memory optimization program displays various processes running on your PC along with their respective memory usage. I am not sure how this freeware optimizes memory, but it did successfully optimize my PC’s memory. Glary Utilities is a popular free PC optimization software that can optimize each aspect of the PC. One of the option it provides is Memory Optimizer feature. This feature can Auto Optimize memory based options selected by you. You just have to enable Auto-Optimization feature and it will automatically optimize the PC’s memory as per the options you select, which are: Optimize automatically when free memory at, Increase free memory to, and ONLY optimize if CPU-Usage is below. You can also set this freeware to load and function at Windows startup. To carry out manual optimization, you can just set the Memory amount to be freed with its slider bar and click on Optimize button. Apart from these, you can view CPU Usage and Physical memory usage graph on the interface and get the idea about the status of PC’s memory and know when to optimize it. I was pretty much impressed with this memory optimization utility of Glary’s PC optimizer program. It worked well and freed up memory space to a great extent. MemOptimize is another free memory optimizer software. It offers simple and easy memory optimization process for which you just have to click its Start Optimization button and the process will be initiated. Although this free memory optimization program doesn’t have any other feature other than its main task, which is optimizing the PC memory, you can view Used Memory and Free Memory on its interface. Also, the progress of the ongoing memory optimization task is displayed in the Progress Bar. I am not sure how internally this software takes care of memory optimization, but its website mentions that it moves old applications to system page file (which is actually hard disk, instead of RAM), and this frees up space in RAM, which can further be used by the new applications that you open. This sounds like a pretty intelligent strategy to free up RAM on PC. The downside of this software is that it does not come with auto-optimization feature, and you have to manually initiate this software whenever you think your PC is running out of memory, or you are planning to run heavy programs like games. PC Brother Memory Optimization Free is an open source memory optimizer software with which, you can manually free up PC memory. You can optimize your PC memory with a single click and view the total amount of memory space freed after optimization process is complete. It has an attractive interface which displays different options, namely: Usage, Optimize, and Logs. It maintains Logs for all the optimization task performed. Apart from all these features, CPU Usage, Memory Usage, and Page File Usage are also displayed percentage wise, along with a real-time chart. Although this freeware mentions about Auto Optimization feature, I am not sure how it is enabled as I cannot find any option for it. However, when the memory optimization task is initiated manually, this feature is enlightened as a running process. MemMAX is a simple and easy to use Memory Optimizer software that offers Manual Memory optimization. This manual optimization is very simple and can be carried out in a single click. It features dual mode for Memory Optimization: Free optimization and Maximum optimization. It lets you set the number of passes up to 9 times for a single memory optimization task. Its interface displays Memory Stats for Physical, Pagefile, and Total memory space in terms of percentage. You can also view real-time graph plot for Free physical memory and Free Page in Stats history menu. One peculiar feature of this freeware is that you can set Unit of Measurement in Kilobyte or Megabyte. Although it lacks Auto-Optimization feature, still this free memory optimizer performs its task well and can be used when you want to manually free up RAM on PC. Smashing Memory Optimizer is a simple memory optimizer program. It lets you optimize your PC’s memory with a single click. For manual optimization, you just have to click on its Optimize Now! button and the process will be started at once. It doesn’t have any feature other than manual PC optimization. It displays CPU Usage, Memory Usage, and Disk Usage. This freeware is just a simple program to carry out memory optimization task manually. It seems more like a Task Manager program rather than a memory optimizer, as it displays All Programs and Opened Windows. These displayed programs in their relative window are shown with Memory Usage, CPU Usage and Disk I/O details and you can easily hide or close them if you want. Baidu Cleaner is a free Junk file remover program which can help you optimize memory besides removing junk and unwanted programs from your PC. It has an inbuilt Memory Optimizer program, known as Clean Genius, with which you can manually optimize your PC’s memory easily. 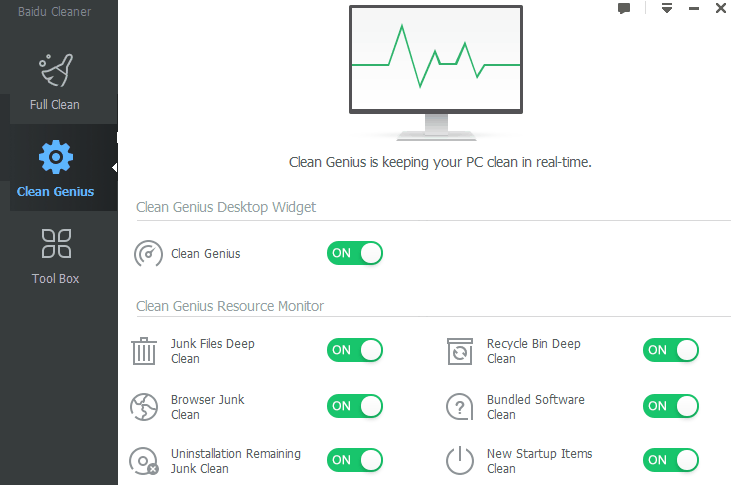 This Clean Genius memory optimizer is displayed as a small widget on your system’s screen. When you click on this widget, it will expand with the features required for Memory Optimization. A Memory usage meter is available which displays usage in percentage. One good feature of this free memory optimizer program is that, it hints you to optimize memory sector and idle services (Recommend to optimize) along with some Optional Optimizations options. Although this freeware lacks any Auto Optimization feature, still it can serve well when needed to manually optimize your PC’s memory.